James Wootson Goode also went by the name of Woot Goode. He was born in February 1863 in Madison County, Georgia. He married Mary Sophronia Bagwell, daughter of William Wilkes Bagwell and Cinthia A. Tracy, on 14 December 1884 at Cherokee County, Georgia. James Wootson Goode died on 17 January 1941 in Terrell County, Georgia, at age 77. Louisa L. Neighbors was born on 2 January 1829.1 As of 22 December 1859,her married name was Bagwell.1 She married John J. Bagwell, son of John Littleton Bagwell and Rebecca "Sally" McAbee, on 22 December 1859 at Spartanburg County, South Carolina.1 Louisa L. Neighbors died on 24 September 1893 at age 64.1 She was buried at Cedar Spring Cemetery, Spartanburg, Spartanburg County, South Carolina. 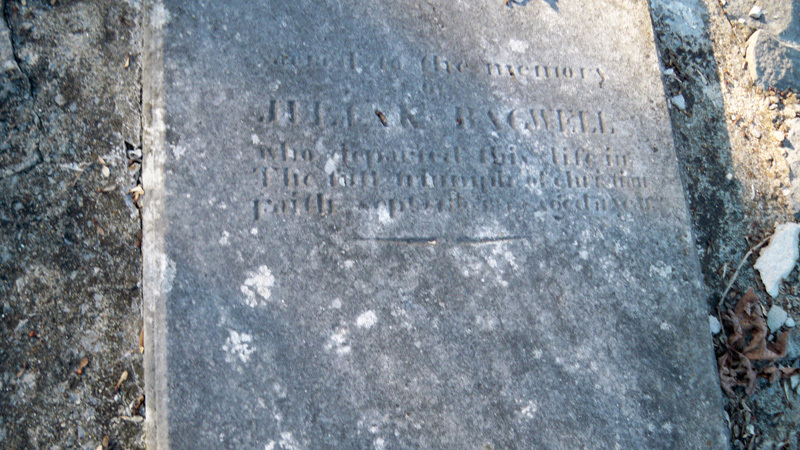 [S1320] Jessie F Bagwell Grave Stone, Find a Grave, www.findagrave.com. [S1543] United States Federal Census, Washington, District of Columbia, Population Schedule: Montgomery, Tennessee; Page: 263, Dwelling: 1413, Family Number: 1413, Date: 1850. [S1321] Email from Sandra Bagwell dated March 2010 to Hunter Wayne Bagwell - Subject Line: Richard Bagwellls. [S1542] United States Federal Census, Washington, District of Columbia, Population Schedule: District 5, Montgomery, Tennessee; Page: 20, Dwelling: 133, Family Number: 136, Date: 1870. Samuel Bagwell was born in 1796. He was the son of Drury Bagwell and Catherine Ware. Samuel Bagwell died on 8 December 1824 in Wetzel County, West Virginia. Nicholas E. Bagwell was born in 1797. He was the son of Drury Bagwell and Catherine Ware. Nicholas E. Bagwell died on 18 March 1835 in Montgomery County, Tennesse. The limestone slabs were brought up McAdoo Creek after all of their deaths. [S2196] Email from Kurt Bryant dated December 2011 to Hunter Wayne Bagwell; Subject Line: Keziah Bagwell Stamper. Susannah McFadden was born in 1786 in Rutherford County, North Carolina.1 She married John H. Bagwell, son of Drury Bagwell and Catherine Ware, on 5 September 1820. Susannah McFadden and John H. Bagwell lived in 1850 in Cass County, Georgia.1 Susannah McFadden and John H. Bagwell lived in 1860 in Polk County, Georgia. [S4662] United States Federal Census, Washington, District of Columbia, Population Schedule: Division 12, Cass, Georgia; Sheet: 29, Dwelling: 205, Family Number: 205, Date: 1850. Nancy L. Bagwell was born in October 1834 in North Carolina.1 She was the daughter of John H. Bagwell and Susannah McFadden. As of 30 October 1858,her married name was Rogers. Nancy L. Bagwell married James A. Rogers on 30 October 1858 at Polk County, Georgia. As of 19 May 1872,her married name was Jones. Nancy L. Bagwell married Hugh O. Jones on 19 May 1872 at Polk County, Georgia. Nancy L. Bagwell died on 14 July 1903 at age 68. James A. Rogers was born circa 1833 in Georgia. He married Nancy L. Bagwell, daughter of John H. Bagwell and Susannah McFadden, on 30 October 1858 at Polk County, Georgia. Littleton R. Bagwell was also known as Litt Bagwell. He was born in January 1827 in Montgomery County, Tennessee. He was the son of Richard Bagwell and Sarah Hughes. Littleton R. Bagwell married Mary Jane Brown on 20 November 1859 at Montgomery County, Tennessee. Littleton R. Bagwell died on 10 August 1918 in Montgomery County, Tennessee, at age 91. Mary Jane Brown was also known as Mary Jane Mall. She was born in January 1829 in McAdoo, Montgomery County, Tennessee. She married Littleton R. Bagwell, son of Richard Bagwell and Sarah Hughes, on 20 November 1859 at Montgomery County, Tennessee. Mary Jane Brown died before 1910. James L. Bagwell was born circa 1860 in Montgomery County, Tennessee. He was the son of Littleton R. Bagwell and Mary Jane Brown. Benjamin Franklin Bagwell was also known as Frank Bagwell. He was born in 1866 in Tennessee. He was the son of Littleton R. Bagwell and Mary Jane Brown. Benjamin Franklin Bagwell married Dora Ann Watson on 16 February 1898 at Montgomery County, Tennessee. Benjamin Franklin Bagwell died on 4 May 1937 in Montgomery County, Tennessee. Nicholas Robert Bagwell was born in 1872 in Tennessee. He was the son of Littleton R. Bagwell and Mary Jane Brown. Nicholas Robert Bagwell died on 30 April 1947 in Montgomery County, Tennessee. He was buried at Blanton Cemetery, Montgomery County, Tennessee. Laura Amie Bagwell was born circa 1864 in Tennessee. She was the daughter of Littleton R. Bagwell and Mary Jane Brown. Laura Amie Bagwell died after 1930 in Tennessee. Elizabeth E. Bagwell was born circa 1868 in Tennessee. She was the daughter of Littleton R. Bagwell and Mary Jane Brown. Ira E. Bagwell died in 1901 in McEwen, Humphreys County, Tennessee. He was born in 1901 in McEwen, Humphreys County, Tennessee. He was the son of Christopher Columbus Bagwell and Allie Duke. Walter N. Bagwell died in 1904 in McEwen, Humphreys County, Tennessee. He was born in 1904 in McEwen, Humphreys County, Tennessee. He was the son of Christopher Columbus Bagwell and Allie Duke. Adrian Leroy Bagwell was also known as Bud Bagwell. He was born on 22 September 1905 in McEwen, Humphreys County, Tennessee. He was the son of Christopher Columbus Bagwell and Allie Duke. Adrian Leroy Bagwell married Evie Thompson on 12 April 1929 at Dickson County, Tennessee. Adrian Leroy Bagwell died on 20 February 1970 in Akron, Summit County, Ohio, at age 64. Homer Fulkerson married Ada LuFrances Bagwell, daughter of Christopher Columbus Bagwell and Allie Duke, after 1915.